Yup, this is a thing that is happening. 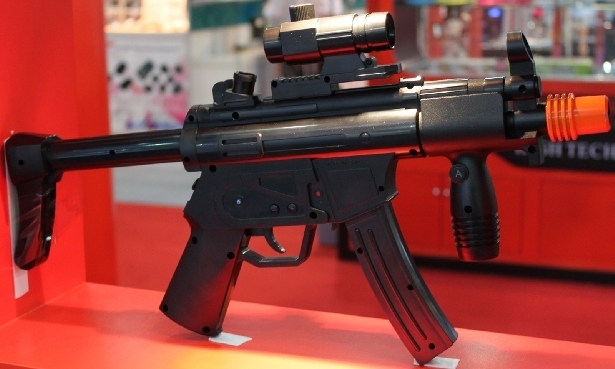 Pocket-Lint went to a trade show in Hong Kong where they spotted this 1:1 scale Heckler & Koch MP5 sub-machine gun. Unlike all of the other plastic gun shells out there, this gun actually has the Wiimote, nunchuck and even MotionPlus all built into it already. The sub-machine gun also has rumble functionality, speakers and rechargeable battery that can be charged up through a USB cable. The Chinese company that made the sub-machine gun controller is looking to bring it to the US, but something tells me they're going to have one hell of a time doing it. Even with the orange tip, this thing looks way to real. Even though I know this thing is useless and will most likely cost way too much if it does get released here, I still really want it.